Suitable for single beds, this Fleece Electric Under Blanket is made from polyester fleece providing the user with warmth, comfort and cosiness. 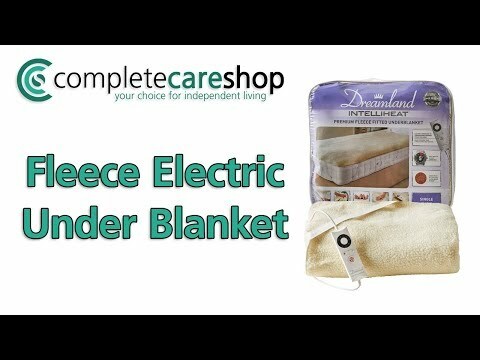 Ideal for those with painful arthritic joints, or people who have aching muscles, the electric under blanket gently soothes aches and pains, and relieves built up tension resulting in an incredibly relaxing night's sleep indeed. The blanket is easy to fit and has a handset with a basic layout that is simple to use, even in the dark thanks to its colour coded LEDs. For complete peace of mind, the electric under blanket is supplied with a three year manufacturer's warranty and is safe for machine washing and tumble drying. Larger sizes of the Fleece Electric Under Blanket are available in this area of the website. Good to find what I wanted in the right size. Very quick delivery and item looks very good but haven’t used it yet!